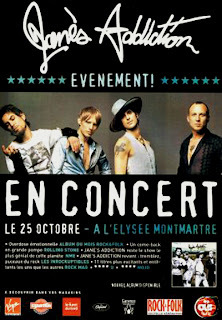 This is Jane's Addiction performing live at Elysée Montmartre, Paris, France back on the 25th October 2003. The concert was broadcast by the French radio "OUI FM", the concert was in support of their "Strays" album release. Jane's Addiction is an American alternative rock band formed in Los Angeles, California in 1985. The band's original line-up featured Perry Farrell (vocals), Dave Navarro (guitar), Eric Avery (bass) and Stephen Perkins (drums). After breaking up in 1991, Jane's Addiction briefly reunited in 1997 and again in 2001, both times with Avery declining to participate. In 2008, the band's "classic" line-up, featuring Avery, reunited and embarked on a world tour. Avery subsequently left the band in early 2010 as the group began work on new material. To date, they have released four studio albums. This is Los Lobos performing live at The Pavilion, Portland, ME, USA back on the 27th July 1997.